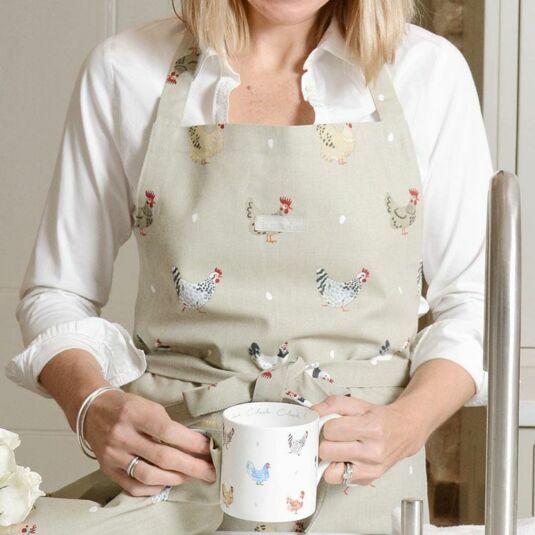 Like Sophie Allport? Click here to view the entire range. 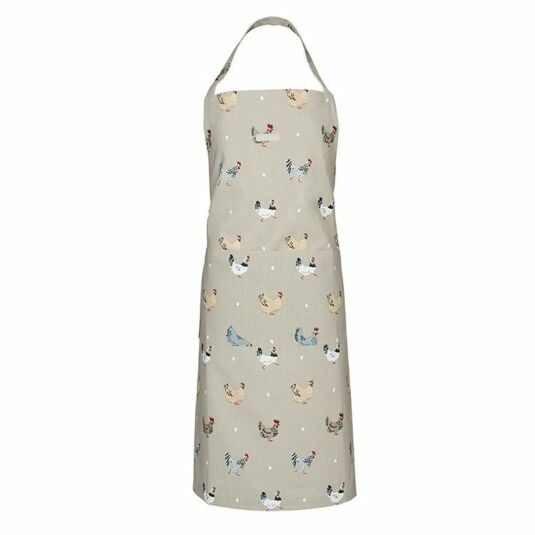 Part of Sophie Allport’s ‘Lay a Little Egg’ collection, is this adult apron decorated with beautiful illustrations of Sophie's favourite chickens; Speckled Marans, Sussex Hens and some rather unusual blue and buff Orpingtons on a light beige background with little eggs part of the pattern. There is a double pocket at the front of the Apron which is perfect for holding your utensils while you cook. Classy, elegant, and full of country chic charm, it will make a gorgeous addition to any kitchen, and is sure to bring a touch of style when whipping up a culinary delight! For that extra special gift, add a matching item from the same range, such as a mug or tea towel. This is a wonderful gift, for anyone who loves chickens, could be your mother, sister or wife, a lovely Easter, birthday or Mother’s Day gift. This apron is 100% cotton and is 72cm x 90cm. All the fabric items are machine washable. Not recommended for dry cleaning or tumble drying. Do not bleach. Brought to you by British homeware designer Sophie Allport is this wonderful range called ‘Lay a Little Egg’ featuring illustrations of Sophie's favourite chickens; Speckled Marans, Sussex Hens and some rather unusual blue and buff Orpingtons, all interspersed with little white eggs, are depicted on a light beige background. This is a beautiful collection of kitchen textiles and fine bone china to add a classy, country chic aesthetic to your home.